The Enigma was a rotor machine used by the German Military during WW II to encrypt messages they sent to each other. It was invented by German Engineer Arthur Scherbius in 1923. The Enigma Code Machine consisted of a plugboard, three rotors and a reflector which redirected the electrical current. Each letter entered by a keyboard was matched by an encrypted letter by closing an electrical circuit which was reconfigured after each entry. We need to use secure passwords for our everyday computing. So how about using the Enigma Code Machine to generate secure passwords for us. Dr. Frank Spiess helps us out here with a very good flash Enigma Code Machine. A brief example: Open the machine window, click on the “Input:” textbox and enter “c” on the keyboard. The plugboard leaves C as C while highlighting the specific wire in red. The electrical current then moves to the rightmost rotor, that is, to its letter A. A is then connected to B. The current enters the middle rotor, that connects G with R. The third (leftmost) rotor maps V to I. In the next step, the reflecor maps B to R. Then the current moves way back along the green wires through the rotors back to the plugboard, where Q leads to Q. As a result, we have the encryption of C to Q. If you now enter “c” again, you see that in this case it yields G! This is because the rightmost rotor moves one step to the left before a letter is entered. I admit that there are limitations to using the Enigma Code Machine for generating secure passwords. For starters, you don’t have numbers and special characters as part of your final secure password. 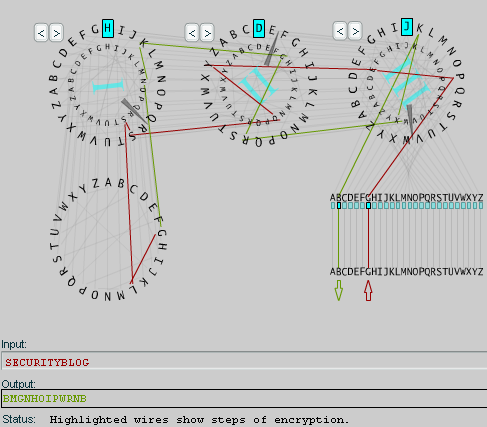 This I believe could be improved… but again, this is the limitation of the Enigma Code Machine.